In 21st Century, terrorism have raised uncertainty about what might happen next outside your home or offices. It increasing stress level. But what can you do to protect you and your family inside your house? Your good health and safety is our chief concern. With over 15 years of experience in tile industry, our engineering team has innovated a tile material that offer you ultimate security, style and peace of mind. 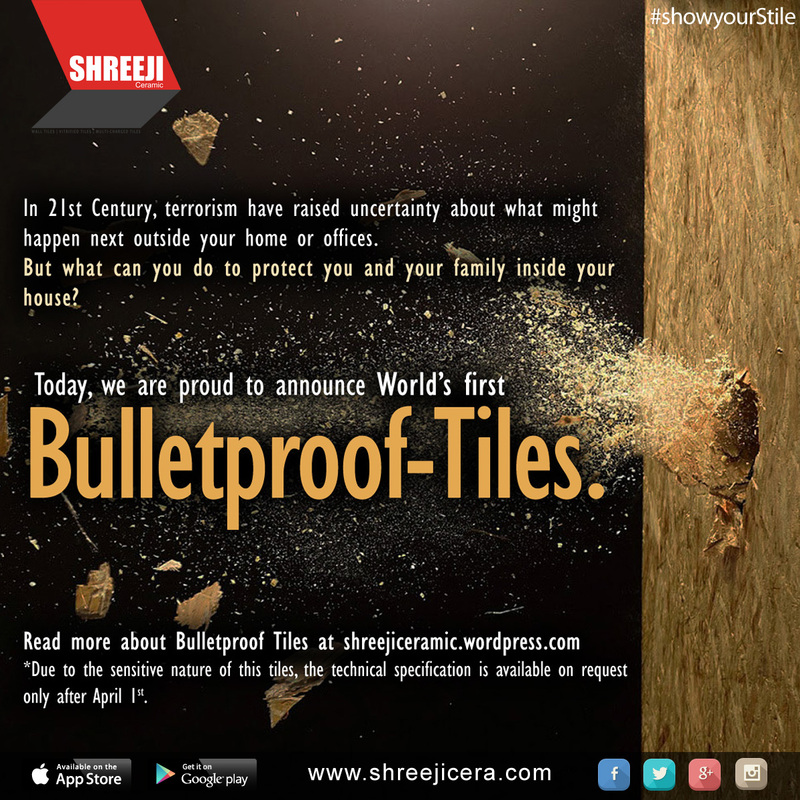 Today, we are proud to announce World’s first Bulletproof-Tiles. Bulletproof Tiles are made of three highly effective layers of protection. We have successfully done testing programme to the highest security standards and against all the equipment of the modern criminal. Bulletproof Tiles is composition of glass coating and plastic films that are bound together on ceramic material. The finished Tile is a single piece that will vary in thickness in accordance to protection level that is required and ranges from 8mm to 15mm. To stop bullets from penetrating the wall tiles in houses. It provides protection against armed attacks from terrorists, robbers, hit men and criminals in general from a plain street assault with a hand gun (.22mm, .38 special, .357/.44 magnum) to an all-out attack with a M-14 rifle. Almost all. From The Pope, Presidents, Prime Ministers to a common families who lives in fear of terror attacks. Anyone can purchase and install Bulletproof Tiles from us. It requires special technology to install so we do suggest contacting our highly professional technical team for inspections and permits. Due to the sensitive nature of this tiles, the technical specification is available on request only after April 1st. Previous Previous post: 2014-15 Accounting Year End is approaching. Next Next post: TileGuide: 5 things to consider when selecting tiles.